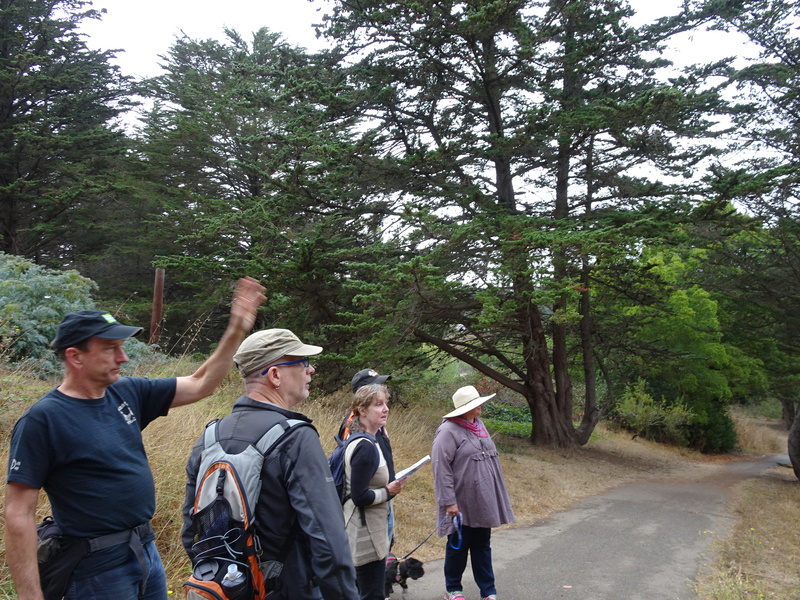 On a Saturday in late August 2015, the San Francisco Forest Alliance organized a walk in John McLaren Park – Natural Areas for a group of our supporters and other interested people. It wasn’t just about a walk through this fascinating park on San Francisco’s southern edge – we all wanted to understand what was planned for its future. 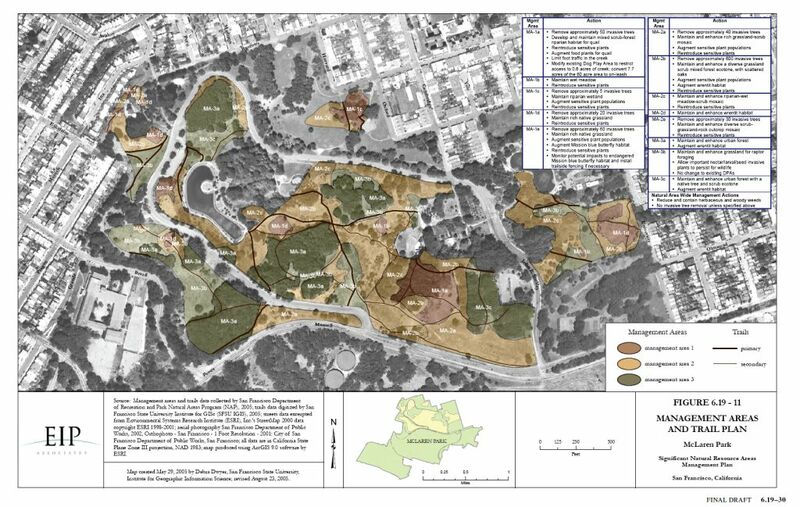 The group wanted to learn about the San Francisco Recreation and Parks Department (“SFRPD”) plans for the Park: elimination of 8.3 acres of dog play areas; the removal of 809 trees ( eucalyptus, Monterey cypress and Monterey pine); and using herbicides to poison the “non-native, invasive” vegetation. The idea is to expand native plants – mainly scrub – in the Park. 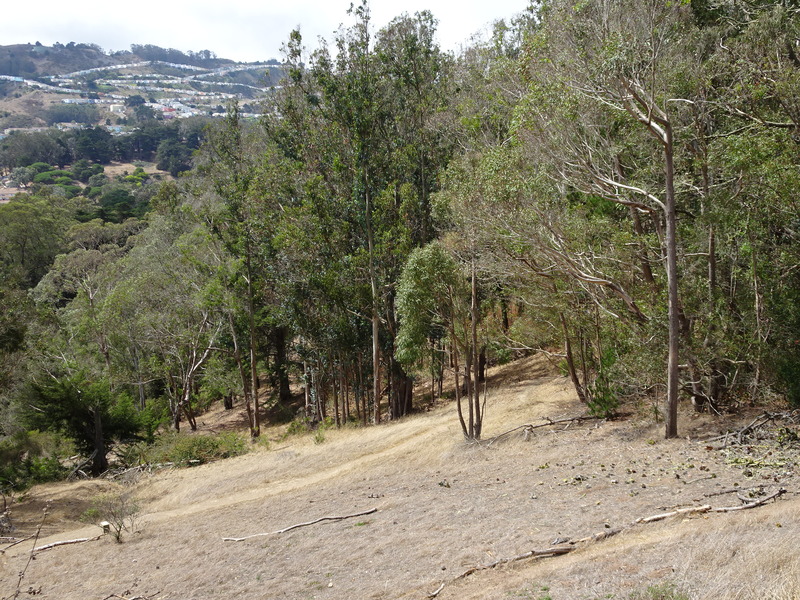 In McLaren Park, nearly all the areas that are not actually built up or used for sports, are designated as “Natural Areas.”The Natural Area covers 165.3 acres and is made up of grassland, scrub, and blue gum eucalyptus trees. These are subject to the “Significant Natural Resource Areas Management Plan” – or SNRAMP (pronounced Sin-Ramp). All the colored areas in the map above – brown, tan, and olive – are subject to SNRAMP. 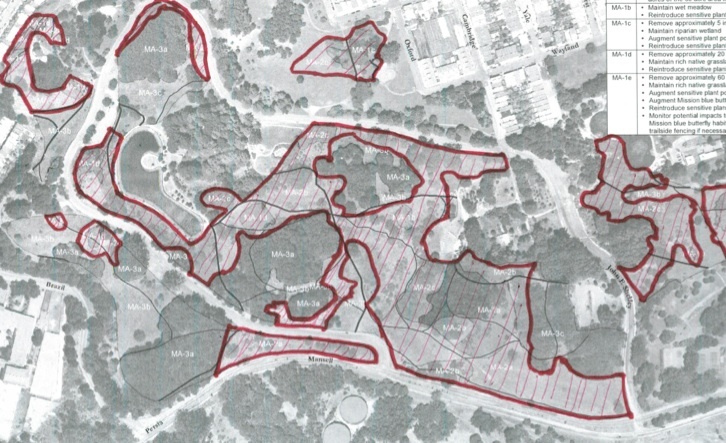 Outlined areas (with diagonal lines) will be “restored.” Trees and shrubs are to be removed. Native species will be planted. The walk was led by Tom Borden, bicyclist, and Ren Volpe, long-time dog walker both of whom know the park and RPD’s plans for McLaren. We started the walk parallel to the Mansell St corridor, where the city plans to change 4 lanes of traffic into 2 lanes for vehicles and 2 lanes for pedestrians and bikes. We believe the city will remove these trees along Mansell. See link to the City’s plans here. We walked along the trail to the Upper Reservoir and saw where the removal of “invasive” trees is planned and the reintroduction of native plants will be undertaken. We walked along the Philosophers Way trail where Tom noted that trees along the sides of John Shelly Drive will be removed. This is presumably to open up to yet more views of the downtown skyline – and to the wind. Our walk continued to the open grassland area south of the Jerry Garcia Amphitheater and parallel to Mansell Street. This photo show where grasslands will created by cutting down trees, and will be closed to people (and dogs). 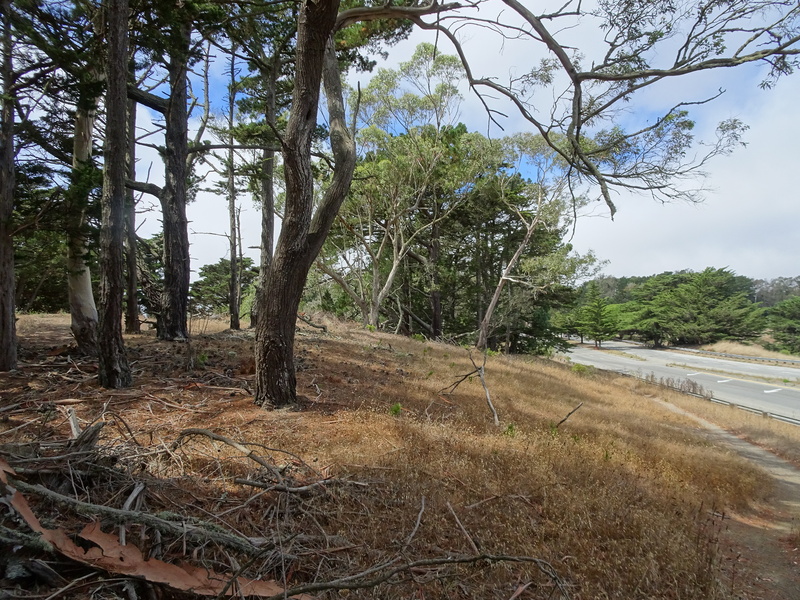 More dog walkers will be coming to McLaren Park when the GGNRA clamps down on dog access in areas controlled by the National Park system (the Presidio, Fort Funston, etc). This will force more dog walkers into an ever smaller area. It’ll be smaller still if NAP further restricts the existing boundaries that NAP is planning for the off leash dog area (now within the John Shelley Drive loop) – which is entirely possible. 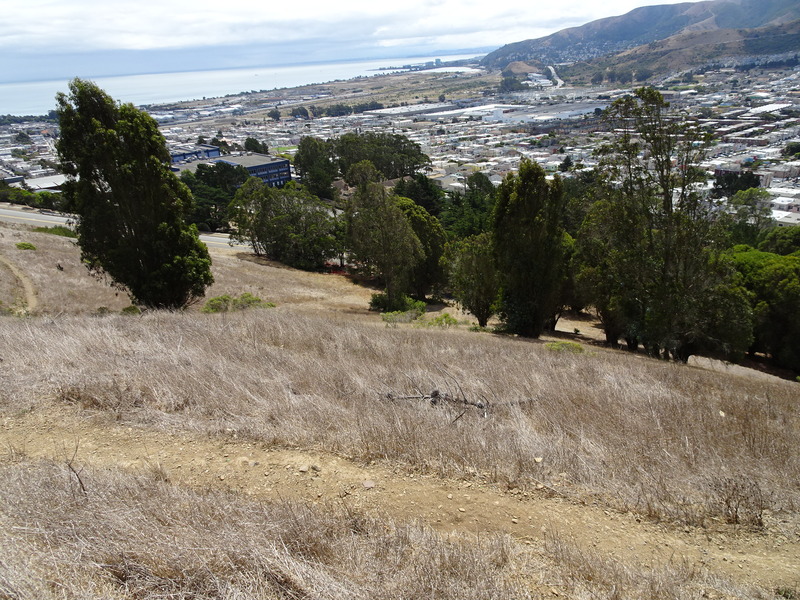 Our tour included the grasslands area that looks down to Visitacion Valley and the Gleneagles Golf Course. We were informed that trails have been closed to bicycles where previously biking was allowed. 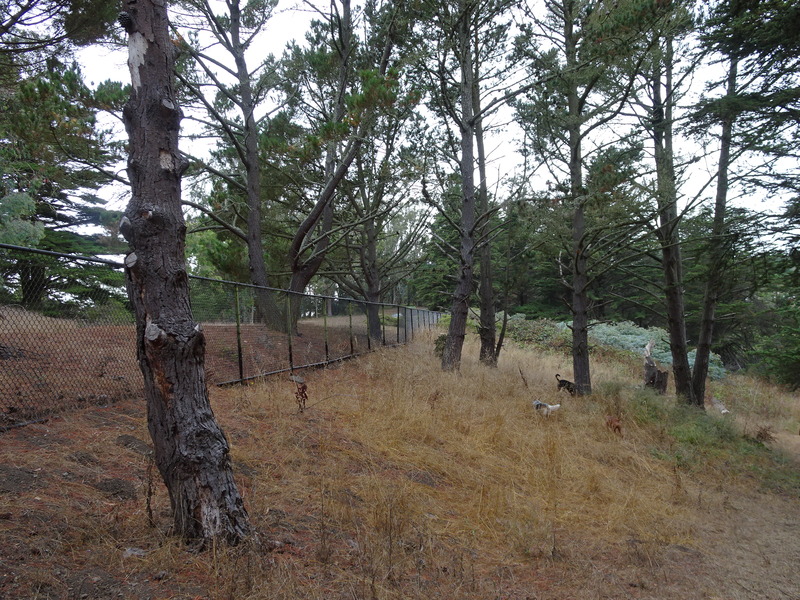 In the area south of Mansell Street, near the 2 water tanks, NAP plans to remove enough trees to allow establishment of a coastal scrub community. That means many of the trees in the picture above will be removed. Local residents of San Francisco (people, bicyclists, dogs and wildlife) get enormous benefits from the beauty of McLaren Park. It’s a welcome respite for a very urban population, surrounded on all sides by freeways and boulevards. Local residents come here to enjoy the serenity and beauty that is just a few minutes from their homes. A lot of that ambiance will be taken away when the City removes hundreds of trees. It’s not just beauty. 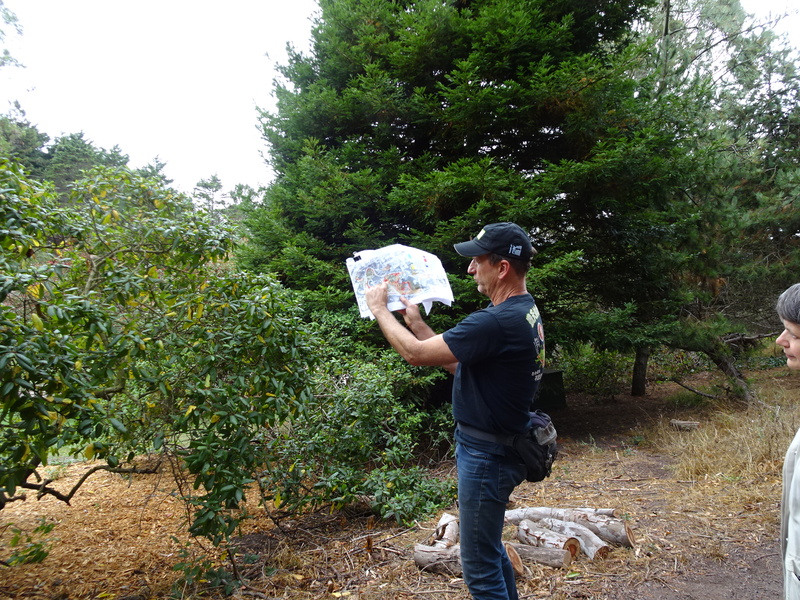 The trees in McLaren Park provide valuable ecosystem services. They fight climate change by sequestering carbon; and mature trees absorb more carbon than smaller young ones. They help fight urban pollution by trapping particles on their leaves, keeping them out of the air and our lungs. It cleans the air, especially fighting particulate pollution, by trapping particles on its leaves that eventually get washed onto the ground. They regulate water run-off and reduce the load on our sewer system. In San Francisco, we have few wildland fires – and when we do, they’re grass fires. When the fog rolls in over the trees of McLaren Park, moisture drops on the ground, allowing for a dense damp understory that fights drought and resists fire. Trees provide wind breaks, thus reducing the impact of wind on surrounding neighborhoods, and also reducing fire hazard. Trees are good for our health. A New Yorker article linked here references a recent study that shows that ten additional street trees on a city block had the same health impact as giving each household $10,000 – or making all the adults seven years younger. Other studies have shown trees improve mental health, reduce stress, and aid healing. SNRAMP is bad for health. Aside from blocking opportunities for outdoor exercise and recreation, it would require the use of large quantities of poisonous herbicides to prevent resprouting of the felled trees – herbicides that are likely get washed down the hillsides and into surface and ground water. The City plans to remove 809 trees in this park since they are labelled “invasive”. We strongly oppose this action. Aside from the beauty of the Park, and the undisturbed wildlife habitat that would both be destroyed, we think it is environmentally irresponsible. Trees sequester carbon; eucalyptus, with its dense wood, its size, and its 400-500-year life-span, is particularly effective. We plan to organize more such small-group walks through beautiful areas that will be impacted by SNRAMP. They are always free, and no donations are expected. They’re guided by people who know the place well. 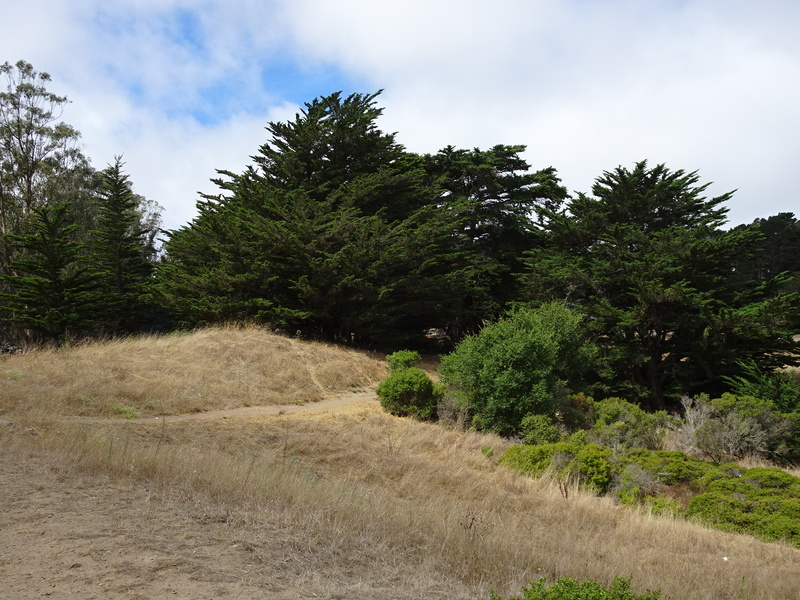 (HERE is a post about our recent visit to Sharp Park in Pacifica.) If you would like to know about the planned walks, as well as get updates about issues of trees and access restrictions, please stay in touch. We encourage you to enter your email address at the top right (“sign me up”) in order to receive our updates directly to your email. If you’re on Facebook, please “Like” our page. https://www.facebook.com/ForestAlliance We currently have 475 “likes.” Help us to take it over 500! 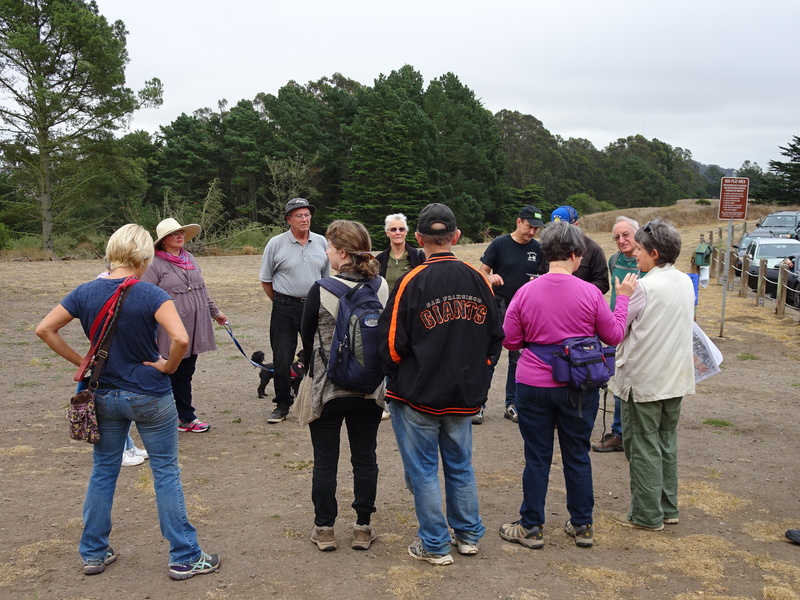 When is the next McLaren Park walk?